Fashion for all kinds of kitchen gadgets is growing every year. Some time ago, a large popularity of the bread machine. They allowed the hosts to easily bake a fresh muffin, not burdened with various impurities. However, over time many kulinarka thought, what else can you cook in a wonderful kitchen helper. The main purpose of a bread machine, as its name implies – bread. Thanks to numerous programs you can easily create a delicious homemade "brick", providing it with useful additives. For example, in addition to the usual bread made from rye or wheat flour, you can master the pastry with the addition of cereals, seeds, nuts, cheese, sesame. Be careful: freshly baked bread is difficult to cut – it is very crumbly. To prevent this from happening, use only a very well-sharpened knives. Also an important function of a bread machine is the ability to prepare dough for rolls, pies and pizza. Your task is simply to lay the required ingredients, set the correct mode and wait for the beep alert. Kitchen gadget itself and will insist kneading the dough to the desired consistency. Please note that sometimes the bread maker must be open in the process. For example, to add the desired ingredients in the bread. It turns out that "smart" stove can compete with fashion today, slow cooker. Resourceful hostess empirically determined that in wife, you can not only bake bread, make jam and pastry, but also work with meat, poultry, noodles and other products. On the forums I specify that the taste of the resulting dishes is excellent. For example, the excellent dining dish will be a potato casserole with bacon. Finely chop one large onion and a little fry on the stove. Smoked loin (200 g)/raw pork chop pieces (1x1 cm), add to the onion and soak in a hot frying pan. Three large raw potatoes grate. Mix with two eggs, add pepper and salt. Connect the mixture of potatoes with the prepared onion and bacon and put everything in the bucket for baking. To cook the dish should be at least 70 minutes, setting the program "Baking". 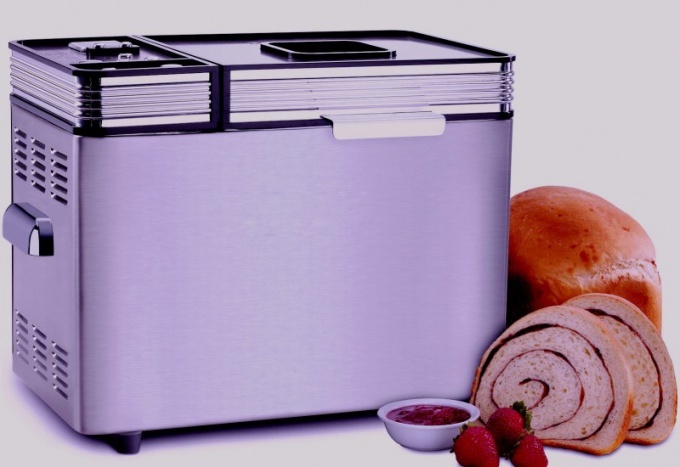 The cooking time should vary depending on the brand and model of bread machine. At the end of cooking, check the dish. If it does not fully cooked yet, add a time. A bread maker would be excellent for cooking a whole chicken. Thoroughly rinse the carcass, RUB with your favorite spices, inside put half a lemon and finely chopped garlic. Completely wrap the chicken with foil/toothpick and place it into the bucket. Select the mode "Baking" for an hour. If the dish is baked in the package, put it under the chicken, slice onions and potatoes. Liquid, massed at the bottom, well soaked them, turning into a very good side dish. In the same way some Housewives baked in the bread maker pork, fish, cook soups. They note that the most important thing is to set the maximum temperature and to monitor the readiness of meals. Also do not forget about safety: the top of the pail cover with foil to frying meat/poultry fat falling on the heating elements.